The terms and conditions given below will govern your accessibility and usage of this site. You will need to abide by these terms and conditions and any additional rules, guidelines or restrictions that may be introduced regarding particular sections or services of this Site. Ruby Print N Pack is reserves the right to make amendments to this Site and these terms of usage at any point of time without notice in advance. These terms and conditions have to be reviewed each time you access this Site. You accept to receive all legal notices and communications that will be provided by us either through posting on our website or an e-mail sent to the e-mail address that is furnished by you to us while registering at our website or emailing to us. The consent to receive communications can be withdrawn by you by electronically notifying to our customer care. This notification will imply that you shall discontinue the use of your account. The terms and conditions as well as transactions made over phone or online will be governed by the laws of Mumbai, India. Ruby Print N Pack will not be liable for damages or delay occurring due to Acts of God, Machinery Breakdown and other reasons including governmental and others but not limited to riot, war, seizure and embargo. Ruby Print N Pack holds the rights to all the tools available on www.rubyprint.in to create the documents. The Buyer's order or Confirmation mail order shall be considered as an acceptance of the terms and conditions of the Seller. All orders will be processed depending on their acceptance by Ruby Print N Pack. An order once placed can be rejected anytime without recourse by us. Changes in price can also be enforced by us after the receipt of the order. No returns will be accepted after the processing and/or shipping of the order. Claims for damaged or defective goods or shortages will have to be furnished in writing immediately on receipt of the goods. Replacement will be done on receipt of the returns and only if there was incorrect processing of the order from our end. No replacement will be obtained in case of misuse or mishandling of the order by the buyer/shipper or in case the order was returned partly by the buyer. Ruby Print N Pack will stop the processing of the buyer's order in case his credit card is declined. Ruby Print N Pack is entitled to recover reasonable legal costs and fees from the buyer in case it needs to undertake legal action in this context. No explicit warranty, guarantee or responsibility will be undertaken by Ruby Print N Pack may or may not replace the defective goods brought by the buyer. The goods will be shipped by a shipping carrier of good reputation. However, Ruby Print N Pack will not be liable for any inconvenience caused due to delay or damage of goods while they are with the shipping carrier. Ruby Print N Pack shall not be liable whether under contract or tort (including negligence) to the client or any third party for any minor or significant damages occurring on account of carrying out or not carrying out any of our obligations. Ruby Print N Pack shall not be liable for any type of financial losses, expenses, cost and damages of any kind whatsoever to any individual, be it client or a third party. The Buyer consents that Ruby Print N Pack will not be held responsible for any and every loss, expense, cost and damages (including costs of legal proceedings) due to any or all type of claims, actions, demands and proceedings that may be carried out against Ruby Print N Pack for reasons that the work in question violates trademarks, copyrights, service marks or is disreputable or transgresses any individual's right to privacy or any other personal right. 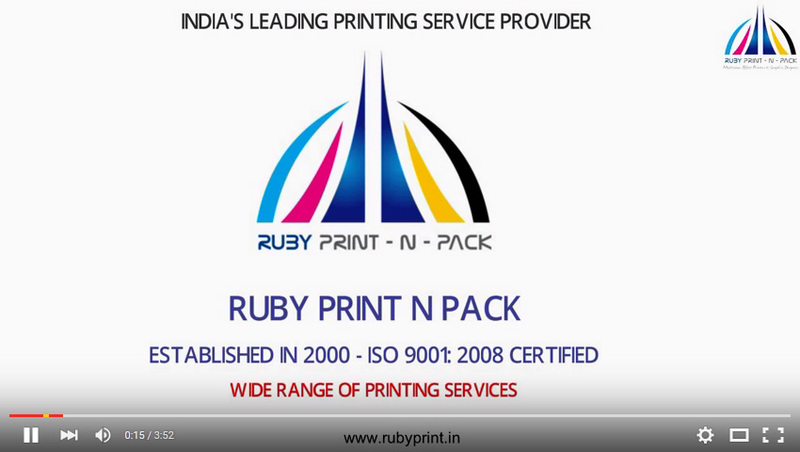 Ruby Print N Pack shall consider all feedback, blogs, comments etc given by the user as non-confidential information. Submission of any such information shall constitute your consent to transfer and assign free of cost all of your title, right and interest in the information together with all copyrights and any extra intellectual property rights by Ruby Print N Pack You consent to let Ruby Print N Pack make use of such information without any restriction. Information pertinent for undertaking the transaction (Content) like photographs, graphics, images, artwork, document layouts, fonts, text, software tools, music and any other is contained in our Site. Appropriate trademarks, copyright and other proprietary rights as applicable ensure that all Content is protected. You are strictly prohibited from redistributing, copying, using or publishing any such matters or any section of the Site. The right to delete, add or change any section of the Content without advance notice regardless of the time rests with Ruby Print N Pack. No claim or right is obtained by you over any individual components of the Contents like logo design elements though you may have created a logo design or/and incorporated a logo design into several or single product. Other users of Ruby Print N Pack may utilize the design tools for creation of logos which have exact or similar permutation of these elements and no guarantee will be given by Ruby Print N Pack that there will not be similarities between your logo and logos that are created and used by others. No warranty whatsoever will be given by Ruby Print N Pack with respect to logo designs produced using the design tools as to whether they will be a cause of an infringing claim or infringe the trademarks or any additional rights of other party. The responsibility of obtaining an attorney's advice for ascertaining whether you can legally use the logo design and in doing so there is no infringement of another party's rights, rests solely with you. No guarantee of exactness will be given by Ruby Print N Pack as to the texture and appearance of the final customized product placed in the order by the user. The possibility of the quality of services, products, information or other material brought or acquired through this site not meeting your expectations cannot be ruled out. Certain features of your custom-made product like the color, size, print size, print process, print color etc may require minor changes to be done due to limitations caused by product available, production equipment capabilities available, production materials available and also limitations brought due to type and quality of the design given by you. In such cases, it is the sole prerogative of Ruby Print N Pack to take the required decision. However, all efforts will be taken to help you in all ways possible. Acceptance of cookies is not a prerequisite to visit the Site. At the same time, activation of cookies is essential for purposes of ordering as well as ensuring the working of all functionalities of the Site. Cookies comprise tiny text files which help in identifying your computer as a unique user to our server when specific Site pages are visited which are stored on the hard drive of your computer by your Internet browser. Cookies identify your Internet Protocol address and this saves time when you are in the midst of visiting the site or are on the site. Cookies are used to provide greater user convenience (for example your shopping cart can be amended without re-entering your email address) and not utilized for extracting or utilizing information pertaining to you. You can set your browser to not accept cookies but that will put restrictions on your usage of the Site. We assure fully that our cookies are virus-free and also free from any private and personal details. More information about the cookies can be obtained from http://www.allaboutcookies.org or visit http://www.allaboutcookies.org/manage-cookies/index.html for information to remove them from your browser. No refunds of money shall be made by Ruby Print N Pack and its affiliated company for orders that are already proceed or shipped.